The Bell Aircraft Corporation airplane, known as 'Fertile Myrtle' sits on the ramp with the Boeing B-29. 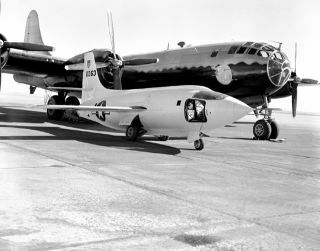 In this historic photo from the U.S. space agency, the Bell Aircraft Corporation's X-1-2 sits on the ramp in January of 1949, at NACA's High- Speed Flight Research Station with the Boeing B-29 launch ship behind. The B-29 was fondly referred to as "Fertile Myrtle." The painting near the nose depicts a stork carrying a bundle which is symbolic of the Mothership launching her babe (X-1-2). The pilot access door is open to the cockpit of the X-1-2 aircraft.